As we work with a lot of photos on our iPads, it becomes a little messy to find images being looked for. In iPhoto on the desktop, it is possible to create folders for images then sync to appear on the iPad. But, on the iPad, there is no way to create folders for images, or move images between folders created on the desktop. On the iPhone, we use Photo+Folder. 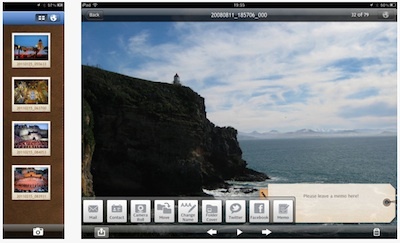 And now with the release of Photo+Folder HD, we can do the same photo management on our iPads. 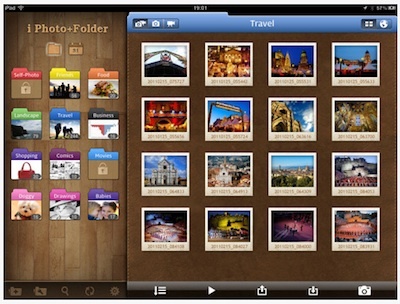 Photo+Folder HD takes a copy of the photos in the iPad’s Photo Library and gives you the power to sort into folders, create new folders and even rename the photo (plus a few ‘extras’ like rotate). Initially we were concerned about doubling up on the size of the photo storage since Photo-Folder HD uses a copy of the image. Soon we found this to be a good thing since we can sync and manage our unaltered photos through the normal iPhoto path, even remove them from the iPad. While still being able to store/use our photos in a much more manageable folder system. For those needing a bit of personalization, Photo+Folder HD has a variety of background art from serious ‘wood’ finish to fun poke-a-dots. Back up and desktop sync is still handled by iTunes with the option of a WiFi backup also. 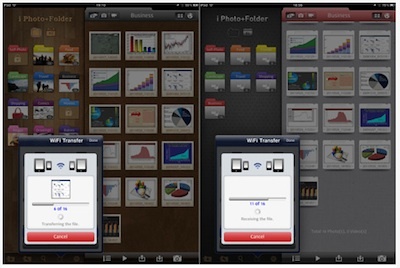 If your around other Photo-Folder users, you can share images via WiFi and Bluetooth. Sharing isn’t limited to one iOS device to another, images can also be shared through Twitter and Facebook. As well, exported to other apps on the iPad like ReaddleDocs and online to DropBox.